Sony Online Entertainment has announced the forthcoming closures of EverQuest Online Adventures, Star Chamber: The Harbinger Saga, Infantry and Cosmic Rift. It's not a great day to be a fan of certain old-school SOE online games. 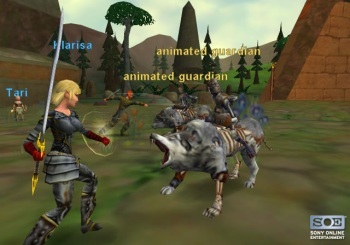 EverQuest Online Adventures, Star Chamber: The Harbinger Saga, Infantry and Cosmic Rift are all coming to an end as of March 29, 2012. "Each of these games shares a special place in both ours and our players' hearts," Sony said in a farewell message to EverQuest Online Adventure players. "This is not an easy decision, but there comes a time when it's best for our developers to move on to the next adventure, and that day has come." Websites and forums related to the games will be shut down as well, and Sony said it will not license or authorize any emulated versions or fan-operated servers. On the upside, EQ Online Adventure players will get three months of gold membership in both EverQuest and EverQuest 2 or, if they're already EverQuest subscribers, a free three-month SOE All Access membership. Sony is also planning to wrap things up with a celebration of the game's "proud history," details of which will be revealed later this month. The downside is that players of the other three games get bupkis. Full details about the looming closure can be found in FAQs for EverQuest Online Adventures, Star Chamber: The Harbinger Saga, Cosmic Rift and Infantry, although aside from mentioning the EQOA extras, they all say exactly the same thing.